Unexpected projects using 47 extraordinary garden plants. Most of us dream of living a garden-based life filled with beauty, flavor, and nourishment. Stefani Bittner and Alethea Harampolis, owners of Homestead Design Collective, a San Francisco Bay Area landscape design firm, provide their clients with just that. Now in Harvest, their newly released book from Ten Speed Press, these creative garden visionaries share their ideas and growing expertise with the rest of us. For the most ardent gardener, the line between indoors and out has always been a porous one. We snip flowers for the windowsill and scatter bouquets on every horizontal surface in the house. We harvest tender baby greens, sweet garden peas, and (sometimes obsessively) tend our tomatoes. We believe there’s never enough thyme in the garden. Even the soil embedded under our nails or tramped into the kitchen signals our passion for reaping the rewards of tending a patch of dirt no matter how large or small. 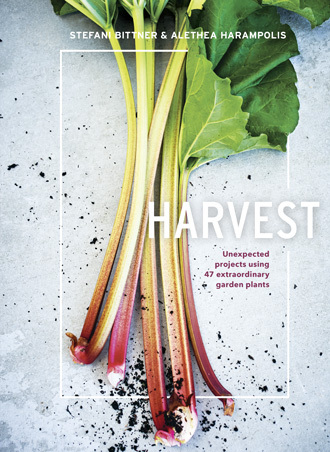 Harvest takes readers through the year and around the garden exploring the “surprising usefulness of petals, leaves, roots, seeds and fruits.” Forty-seven aptly described “unexpected projects” feature a single common garden plant. Small batch rhubarb quick pickles and season-shifting herb salads are a tantalizing switch from the usual jams and jellies dished up in most garden-to-table books. But that’s only the beginning of garden goods that can be harvested throughout the growing season. Seasonal, slightly-untamed floral arrangements—from a casual bunch of spring blooming crabapple clippings, to a dainty summer posy of alpine strawberries, to a showy autumnal persimmon wreath—reinvent and refresh the cutting garden. Other projects include plant-based dyes, herbal infusions, and garden-based cocktail mixings—pomegranate margaritas anyone—as well as natural health and beauty treatments. There’s even a fragrant lemongrass salt scrub that will get those dirty gardener’s hands clean. And when you’re ready to branch out, a table at the back of the book introduces alternative project ingredients that take the book’s 47 projects to dizzying abundance.